Tomorrow morning, watch a spacecraft crash into the moon. The LCROSS mission is going sending a upper stage of a Centaur rocket and a smaller spacecraft to impact the Moon. The two objects will create a crater — The 5,000-pound (2,270-kilogram) Centaur is expected to slam into Cabeus Crater on the Moon’s south pole at a sharp angle at a speed of 5,600 mph (9,000 kilometers per hour). 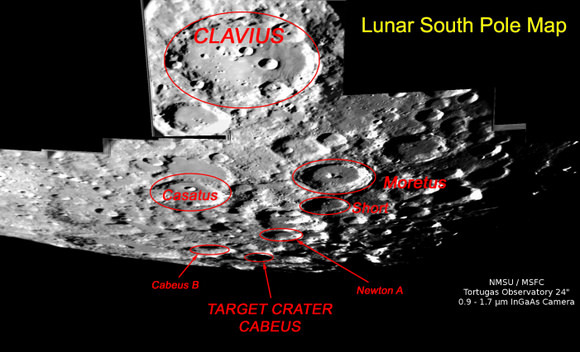 The Centaur’s collision is expected to create a crater roughly 60 or 70 feet wide (20 meters wide) and perhaps as much as 16 feet (5 meters) deep, ejecting approximately 385 tons of lunar dust and soil — and hopefully some ice. The LCROSS spacecraft itself, weighing in at 1,500-pounds (700-kilograms), will follow the Centaur by about four minutes and fly through the regolith plume thrown up by the collision, just before it too slams into the lunar surface, kicking up its own smaller plume of debris, all the while using its sensors to look for telltale signs of water, beaming the information back to Earth. So, yes, it will make a rather big crater on the Moon.